Higashi, T. and Miller, A.L. “Cell-cell junctions sequester Dia1 and Dia2 from the contractile ring to ensure successful epithelial cytokinesis.” Under revision. Stephenson, R.E., Higashi, T., Erofeev, I.S., Arnold, T.R., Leda, M., Goryachev, A.B., and Miller, A.L. “Rho flares repair local tight junction breaches.” Under review. Arnold, T.R., Shawky, J.H., Stephenson, R.E., Dinshaw, K.M., Higashi, T., Huq, F., Davison, L.A., and Miller, A.L. “Anillin regulates epithelial cell mechanics by structuring the medial apical actomyosin network.” Under review. Featured article for “In this Issue”. Chosen by the Editorial Board as a “Highlights from MBoC Selection” to highlight important articles from the most recent issue of MBoC in the journal table of contents and the ASCB Newsletter. 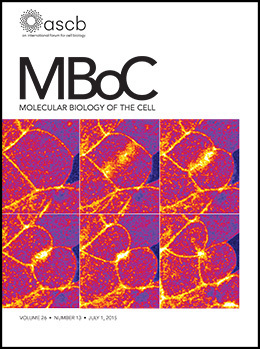 Featured on the cover of the July 1, 2015 issue of MBoC. Highlighted in: Canman J.C. (2009) “Cytokinetic astrology.” Journal of Cell Biology 187:757-759. Highlighted in: Glotzer M. (2009) “Cytokinesis: GAP gap.” Current Biology 19:R162-165. D’Avino P.P. and Glover D.M. (2009) “Cytokinesis: mind the GAP.” Nature Cell Biology 11:112-114.